We have always regarded the markets as a grand casino subject to the manipulations of the Croupier and the House. This being said it is only rational to react in the face of the irrational. I remember speaking to a floor specialist who informed me that he reads the same price charts that most technicians do. This means we should be careful of any traps or head-feints at this critical juncture. No doubt the patterns tell us that we are testing support levels and that technical damage has been inflicted on most stocks including the precious metals. The weak hands inform that the golden bubble may have been broken and the warning inscription written on the entrance to hell “abandon all hope, yea who enter here” may be applicable. We do not agree and may be considering this recent downward move in response to Bernanke and Draghi a fake out and that we may witness a reversal sooner rather than later. Observe that in the midst of the carnage some positive notes are beginning to appear. We feel that this is a classical panic with all of the textbook characteristics of a selling capitulation. 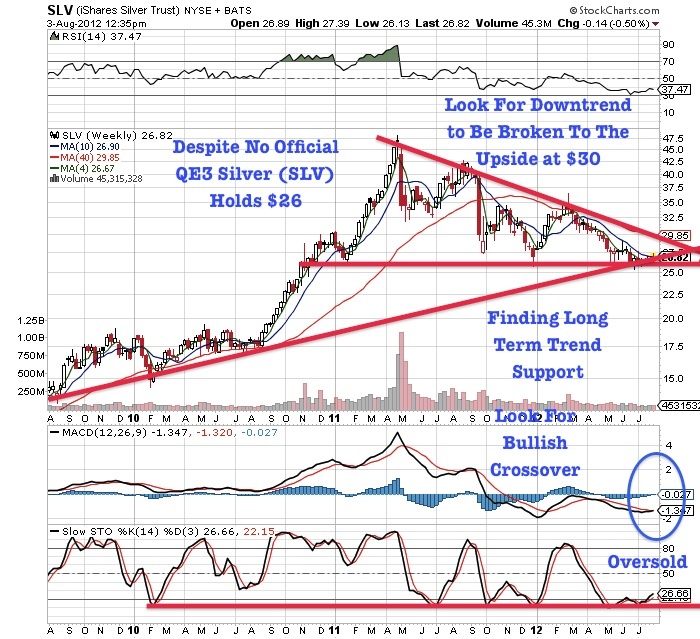 Bullish reversals may soon occur at oversold conditions and is providing long term gold and silver investors additional secondary buypoints. Be not dismayed! The long range upward trajectory of the precious metals particularly gold is continuing higher and has considerably more to go. Factoring in inflation, gold and silver have yet to challenge inflation adjusted all time highs. Most industrial countries are trying to stimulate growth through accommodative easing and through record negative interest rates. Investors in five countries in Europe now face negative real rates. This means they are losing money with their savings in the bank. Many investors are holding the U.S. dollar which has one of the worst real interest rates. Do not forget behind the scenes M2 money supply has reached record levels. This historically leads to hyperinflation. While the amount of money in the economy has grown, the velocity is still weak as institutions are hoarding cash. One method to discourage this is through a devaluation or quantitative easing. Where will the cash go on the sidelines as investors try to exit? Just like in 2009 and 2010, cash went into precious metals and mining stocks. Gold Stock Trades believes that this may occur again in the second half of 2012. That is why we are not encouraging investors to panic into the U.S. dollar at this time and sell their mining stocks and precious metals for pennies on the dollar. The media is trumpeting any bad news on precious metals that is fit to print. Let us take a deep breath and consider the long term picture before making any irrational moves. The picture of gold and miners versus global currencies especially the Euro show that the long multi-year trends are still higher. We have been told by some eminent pundits that there has been a meltdown below the 200 day moving average for the first time since early 2009 and that they are selling everything and are going short. We do not adhere to such actions. We believe the long term trend is being tested but we may find support for a reversal move higher. Instead, we note that investors are rattled and are raising cash, fleeing to U.S. dollars and treasuries, despite knowing that their investments will receive negative returns. Moreover, at times such as these, many nightmarish scenarios begin to haunt the markets. One is that European sovereign nations may sell their surprisingly substantial official gold holdings. See the list published by the World Gold Council/International Monetary Fund above. Astonishingly, Spain has approximately four times the gold holdings as a share of GDP as the United States. Spain has 11.2% vs. The U.S. with 3.1%. The U.S. government debt is 94%, while Spain’s government debt is 60%. Germany and France clock in at 5.8% and 5.3%. Are the dollar and U.S. treasuries such safe havens when looking at this table above? This data may infer that gold may not be dumped by these countries helter-skelter, although investors may be led to believe that the sovereigns are selling. However, the troubled Eurozone nations may have been steadfast in not selling their gold holdings at this juncture. We may doubt that the European’s would resist pulling down the pillars of the temple and that Armageddon has not quite arrived. The Eurozone nations realize they are in need of cash, but still have not touched their precious metals. They realize just like we do that it is their only protection from the printing press. It is inevitable that the European nations and the U.S. will be forced to print to stimulate economic growth. The Euro may be the recipient of active shorting, which serves to drive down the Euro and benefit the U.S. dollar, which smells like a rose in comparison. We are witnessing dollar and U.S. debt strength because world currencies are weak. Eventually, precious metals will regain their footing as the ultimate currency, as treasuries and the U.S. dollar may be in the final stage of its record parabolic blowoff. In the markets nothing lasts forever. Today’s fashions become tomorrow’s castoffs. The support for gold may be $1550 and $26 for silver, which is holding. 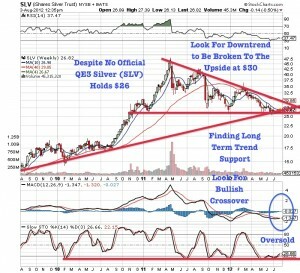 Silver is still testing multi-year lows as well as the miners only to reverse higher. This is not a time to sell, when there is panic exacerbated by Central Bank misdirection combined with the summer doldrums. It is not the first time that gold has had a number of drops from its long range upward trajectory. Undoubtedly, investors may question the fall from grace this year of gold and silver which saw highs of $1900 on gold and $50 on silver in 2011. Now they are trading near the lower parts of its yearly range. Characteristically these metals have always been volatile and subject to breathtaking moves both upward and downward as they revert to their means. Do not forget the long term trend is moving higher and we must use this volatility to our advantage, rather than letting the irrational logic of the crowd divert us from our course. There are enough reasons to explain these mercurial moves. Bernanke’s reluctance to openly inject the markets with the benefits of quantitative easing in 2011, since the expiration of QE2 in April has knocked the wind out of most markets including precious metals. However, let us look at a possible red flag . China which possesses many American dollars and is the largest single holder of U.S. Treasuries may be in danger of economic duress. All the more reason for the Federal Reserve to provide sanctuary for China, which according to the table published above has a limited amount of gold holdings, but at the same time is awash with greenbacks and U.S. paper. This may go a long way toward explaining the dominance of treasuries and dollars as temporary, liquid safe havens. Note from the table above that China has the lowest gold holdings from the list of nations. Rather than feature the true value of precious metals in a shaky market, Bernanke is indeed trying to prevent an explosive move in precious metals by strengthening the U.S. dollar and long term treasuries at the same time. 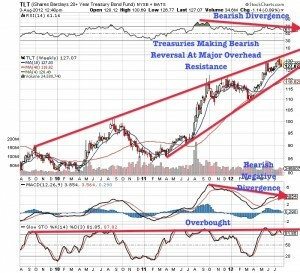 It remains to be seen whether Bernanke can stem the ebbs and flows of the precious metal tides. 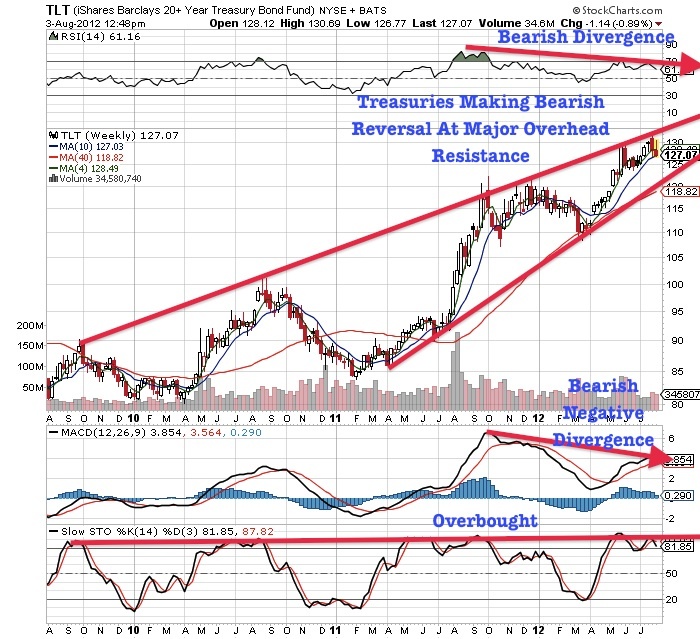 In the past when precious metals and miners have exhibited the possibility of rising and breaking out in 2011 and the first half of 2012, Bernanke instead has squashed them and in fact strengthened the dollar and long term treasuries even when the rating agencies have downgraded the credit of the United States and may do so again shortly. How else can this parabolic move in bonds and dollars be explained when we have witnessed dramatic printing and money supply growth? What the Fed is doing is to panic buyers into accepting low interest rates in the face of a possible hyperinflation. This is why there is no official “QE” announcement although aggressive printing is occurring behind the scenes. This play is far from the finale and we are not quitting on precious metals and miners. Had Bernanke announced QE3, the markets would’ve put on a happier face. Instead, investors are left to rise in despair and get shot down in flames. Nevertheless, the precious metals phoenix will emerge once again from its own embers. Remember, we are witnessing a perfect tsunami at this time. The smell of fear is in the air. This is the summer doldrum selling season during which reason is thrown to the winds and stock prices descend below support. There is an old teaching that sometimes a chart will exceed support on the downside to shake out the weak hands as it reverses to the upside. Sooner rather than later, wounds may heal and present us with astonishing bargains to buy winter coats in the heat of the summer.